Join me and headliner Jeff Caldwell for a show full of hilarity and devoid of vulgarity. After you stuff the turkey – head on out to burn some calories through laughter! 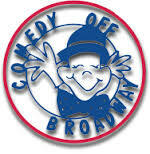 Comedy Off Broadway is conveniently located in Lexington Green at the intersection of New Circle Rd. and Nicholasville Rd. Lexington Green is one block north of Fayette Mall on the same side of Nicholasville Rd. This entry was posted on Tuesday, November 18th, 2014 at 8:31 pm	and is filed under Uncategorized. You can follow any responses to this entry through the RSS 2.0 feed. You can leave a response, or trackback from your own site.